If you haven’t yet had a chance to watch the video about how God was at work to start a KiDs Beach Club® at Floyd Elementary School you definitely want to take about 10 minutes and watch it now. It’s simply incredible to watch how God orchestrated the events that came together to impact children’s lives in Balch Springs, Texas. Beach Club at Floyd Elementary from KiDs Beach Club on Vimeo. Alex Gonzales, the pastor at Hickory Tree Baptist Church, Dr. Tonya Mamantov, the principal at Floyd Elementary, and Lauren Reed, a teacher at Floyd Elementary in Mesquite Independent School District, all took a step out in faith. 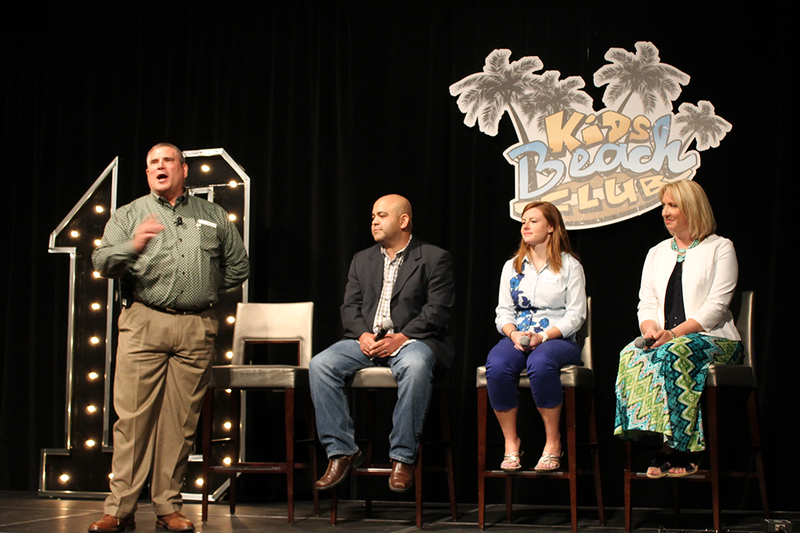 They joined Paul McCollum, the vice president of school relations and development for KiDs Beach Club®, on stage after the crowd at the Bibles for Beach Club Benefit Dinner & Auction watched their story. It was a brief question and answer session to further explain the circumstances that lead to the formation of the club. Lauren responded to a call to prayer. Dr. Mamantov responded to a call to lead boldly and uprightly. Pastor Gonzales responded to a call to go and make disciples. A KBC donor gave generously as God led him to give from God’s provisions to him not knowing how the gift was going to be used. As each of these individuals led out in faith in their various roles, other faithful stewards followed. “We learned of positive culture change in the school,” McCollum said. “We learned of church growth and a renewed urgency of ministry. We heard from volunteers, who feel loved and needed and who have found significance in the work they are doing. We saw children learning God’s word and worshipping a Savior many never knew prior to their KiDs Beach Club experience. And the result has been God using each person and circumstance to bring about His glory. God could do it without us, but He has given us the grace and opportunity to be partners with Him in His plan to reach a lost and dying world through His church. Together, we can connect kids to Christ and put Bibles in their hands!